What Type Of Front Door Material Should I Pick? 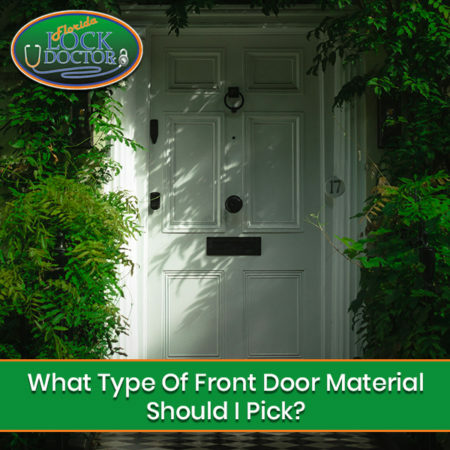 We know, it should unimportant at first, but deciding upon which material should you pick for your front door can actually be harder than you imagine. Exterior doors offer visual appeal and security, besides insulation, so it’s very important to keep in mind that you need to pay extra attention to the material it’s made of when picking one. Also, we’re talking about the front door here, which is somehow the most important door on one’s home, meaning that it deserves extra attention. Ok, so, keeping it short, we’re going to go through some of the most popular front door materials of the moment and see which one is actually the best. Let’s proceed, shall we? Probably the most common choice, wood is a great material for front doors, as it’s good looking and easily customizable. There are several types to choose from, including pine, fir, oak, as well as many others, not to mention the variety of finishes, if you want the door to match your décor. The biggest downside is the fact that it can sag or peel over time, especially when subjected to difficult weather conditions. Still, you can opt for a solid-core, wood-veneer door, which is less expensive and less prone to warping, not to mention that it ups the insulation value of the door. If you’re looking for a front door able to provide energy efficiency, security, and durability, one made of steel is the choice you should make. It has a high insulating value, not to mention that it’s the most secure material and requires less maintenance. A steel front door can be painted in any color and it’s available in various styles, while the price is also a big plus. Sure, they can dent and rust, and don’t look that good as real wood, but overall, steel doors are excellent choices. Made up of composite materials, insulated fiberglass front door are secure and energy efficient, when compared to traditional wood models. They are very strong and durable, not to mention that the amount of maintenance they require is minimal. Most models feature a wood-like finish and they do very well in time, so there’s no need to worrying about warping. However, they can be susceptible to fading, but otherwise, there are a few disadvantages that should worry a potential buyer. As for the price, they can be a bit expensive, featuring price tags similar to those of high-end wood front doors. Last but not least, we have aluminum front doors. They are very similar to steel and fiberglass doors, from a lot of points of view, while they are low maintenance and won’t chip or rust in time. Simple as that! No matter what type of front door you choose, don’t forget one thing: you never know when you get locked outside! Florid Lock Doctor can help you in such situations! From high-security locks to garage door remotes, no lock is ‘smart’ enough for us! Next PostNext Are Key Fobs and Keyless Start Technology Actually Safe for a Car?